Hugo Rohling and Cynthia Zanuni of Brazil have gone viral after this incredibly heartwarming video of their first dance as a couple hit the Internet. Rohling, who uses a wheelchair since a motorcycle accident five years ago left him paralyzed, received a helping hand from his dad and brother when it came time for the big dance. Now, that’s what we call a supportive family. 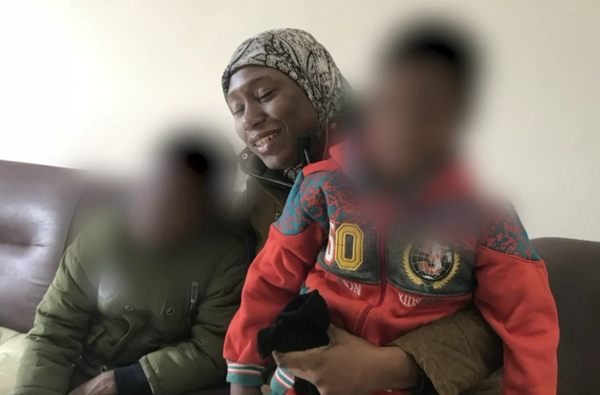 Felicia Perkins-Ferreira of Trinidad had not seen her sons since they were abducted in 2014 by her then-husband and taken to Syria, where he fought for the Islamic State. The boys’ father is presumed to have died in the fighting in 2017, but before then, he had sent the children along with their stepmother toward Turkey, for safety, as the coalition forces closed in. They were found on a roadside, so traumatized that they could not even remember their mother’s name. A human rights lawyer named Clive Stafford Smith heard of their plight and spoke with his friend, Pink Floyd co-founder Roger Waters, who was so moved by Perkins-Ferreira’s story that he volunteered to help. He flew to Trinidad to pick her up in his private jet before heading on to Syria where the boys and their mother enjoyed a tearful reunion. Waters says he could barely contain his relief. Antonia Bundy of the Lafayette Police Department in Indiana was surprised to get a call for help from a young boy who needed help because he was just having one of those days. “Hi, can you hear me?” he says. “I just had a really bad day, and uh, I just came here to tell you that.” Instead of being impatient (911, of course, is for emergencies), Bundy engages him in conversation. What follows is a totally heartwarming exchange (listen to the audio below) that Lafayette PD went on to share on their Twitter feed, though they do caution against using 911 for homework assistance. From the Hallmark Channel’s Facebook page: “To celebrate the 10th anniversary of Countdown to Christmas we’ve got holiday movies on Hallmark Channel every Friday night all year long!” So, basically, our Friday nights for the rest of the year are planned. We are one hundred percent here for cozy, holiday-themed goodness we can enjoy from the comfort of our couch. Good news needs to be spread! Thank you for letting it be known about the good that’s being done, because that’s as noteworthy, and even more important to see, as the negative that we’re bombarded with everywhere else.